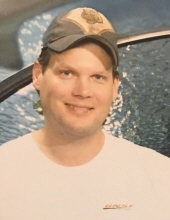 Lance “Bergie” Lee Bergerson, 47, of Hixton, Wisconsin, died peacefully at home in his sleep on April 3, 2019. Lance was born on April 3, 1972 in Black River Falls, Wisconsin, son of Lee and Connie (Olson) Bergerson. He grew up in Hixton and graduated from Black River Falls High School. He was a first responder and volunteer firefighter for Hixton. He was a truck driver for Lindberg Trucking and a railroad conductor for BNSF in La Crosse. Lance went to school in Appleton for fire protection. Lance loved camping, hunting, riding his motorcycle, and spending time with his family and friends. He was a fan of the Milwaukee Brewers, Green Bay Packers and the Cincinnati Bangles. Lance enjoyed woodworking and spending time outdoors. Lance is survived by his wife, Melissa Bergerson; two daughters, Megan and Lauren; and parents, Lee and Connie Bergerson. Celebration of Life will be held from 12:00 noon until 3:00 p.m., Saturday, April 13, 2019 at the American Legion in Hixton, Wisconsin. Jensen-Modjeski Funeral Home of Hixton is assisting the family with arrangements. "Email Address" would like to share the life celebration of Lance Lee Bergerson. Click on the "link" to go to share a favorite memory or leave a condolence message for the family.